One of the things you should be thankful for is when the nail gun was invented. Nail guns have made woodworking projects easier and faster than when you are using the traditional hammering. From small projects like putting together a bookcase to bigger projects likes building a two-story house, a nailer will be your best buddy. It comes in different types that cater to your project’s needs. Bostitch F21PL here has a framing nailer that you might want to check out. Bostitch F21PL Round-Head Framing Nailer is used for framing, subflooring, sheathing, and bracing jobs. Whether you are a professional or a weekend warrior, this is the nail gun of your choice. It is designed to match the task at hand and also finish every project flawlessly and fast. This product always maintains a steady performance, raising the name Stanley-Bostitch on the market. If you’ll read on you’ll know what this powerful tool can do and also how it is the best nailer brand to get. Read our review of this nailer below. What do you get in every unit of this nailer? The Bostitch F21PLcomes with steel guards with anti-skid rubber grip. The steel guards provide the tool with its sturdy design while the anti-skid rubber grip ensures that handling the tool is easy and also feels as comfortable as possible. It also has a magazine capable of holding 60 1.5 to 2.5-inch metal connector nails, or 60 2.0 to 3.5-inch 21-degree plastic collated framing nails. This tool also features a patented push button for varying depth. This button is used to change the depth of the drive with ease. Another aspect of this product that is impressive is its power to weight ratio. It measures 23 * 16 * 6 inches and only weighs 9.1-lb, making it one of the best tools on the market today. For convenience purposes, the tool also has an adjustable after that you can use to hang it when taking a break. It also comes with two quick-change nose pieces. This comes in handy when you need to switch between a metal connector and framing applications. You can also easily switch between the sequential and single firing modes depending on your needs with this tool. The product has a limited warranty of 7 years, meaning you can rest easy while using it knowing that Bostitch has got your back. This Bostitch F21PL1 nailer is packed a bunch of extra features that make it a better framing nailer than others in the market. With this product, you can use either HurriQuake or round-headed nails making it the perfect thing to use in disaster-prone areas where sturdier nails are needed. The two quick change nosepieces make it easy to choose between plastic collated and metal connector nails. The directional exhaust port allows a change in direction quickly before the hot air blows in your face. The steel guards make it durable in a rough environment without wearing and also tearing. 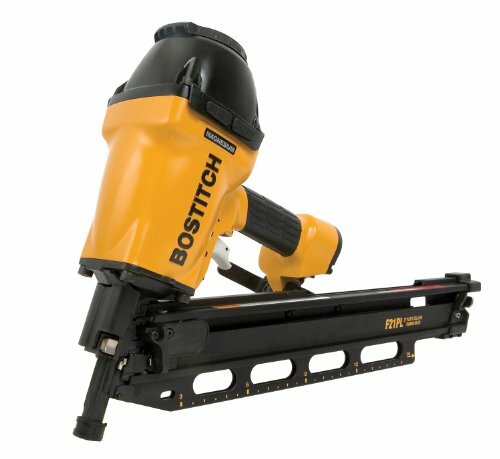 And the reason why this Bostitch F21PL framing nailer is ranked on top is the power to weight ratio, the secret to its light weight other than it’s housing made of lightweight magnesium. So, Is it a great deal right? There a few minor problems with the Bostitch F21PL framing nailer. One is that it is noisier compared to most nailer we’ve checked out so far. Another is the depth adjustment design. The tips keep on moving and can also send nails way too deep if not given attention. Lastly is it isn’t ready to use out of the box. You’ll need to buy an air supply fitting separately. Thinking about these minor flaws, the pros outweigh the cons so it’s kind of good. Wondering what people who had bought this Bostitch F21PL nailer thinks about it? We’ve gathered some of the Amazon reviews of this powerful tool. Check it out below and also read how this framing nailer had changed their lives. “Purchased this nailer because while I value quality tools and quality engineering I couldn’t justify a Hitachi NR83A3 for my summer fence project. I ran about 1250 2″ ring shank stainless steel nails through it and the only time it misfired was when I forgot to add another stick of nails. Even then it never jammed. “Used for total deck (support base) re-build, from post supports (nine), upwards. HEAVY DUTY and (somewhat) heavy in handling. But, once adapting to weight and “feel”, learned how to minimize my “muscling” of the tool and used more appropriate movement and body positioning to increase speed and accuracy. (Would have been very hard to handle if I had used a battery-powered model.) Now, the question is: What do I do with a tool that I love, but don’t need anymore? You can order this product and use it for both small-repair works and full-time construction job. Because of its thoughtful design, lightweight, and durability, we would highly recommend the Bostitch F21PL Framing Nailer to you.